Tooth powders have been around a lot longer than toothpaste. These unique blends work to provide an efficient formula for natural oral health. Made with Pure Ecocert Clays and Salts that will boost you with beneficial minerals, such as, calcium, silica, magnesium, manganese and more. 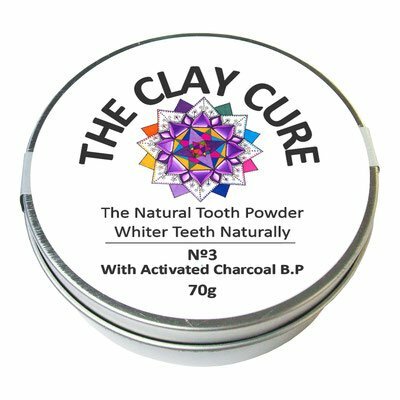 This Natural Tooth powder from The Clay Cure will improve your dental hygiene, regulate vital pH level and help to remineralize enamel. It has natural antibacterial and antiseptic properties and is effective against the formation of tartar and plaques. Activated charcoal is used to whiten teeth and remove stains, particularly from tea, coffee and red wine. Activated charcoal (food grade) - The use of activated charcoal as a medicinal agent dates back to 1500 BC and is commonly used to treat poisoning due to its strong absorption power. It has antibacterial and antifungal properties and will consequently improve gum health and sensitive teeth. Besides bacteria, the use of activated charcoal will absorb toxins and heavy metals in the mouth. Today it has increasingly become popular due whitening effect on teeth. This is due to the fact that activated charcoal is shown to be attracted to a group of compounds known as tannins. Tannins are found in common stain inducing items like wine, coffee or tobacco. 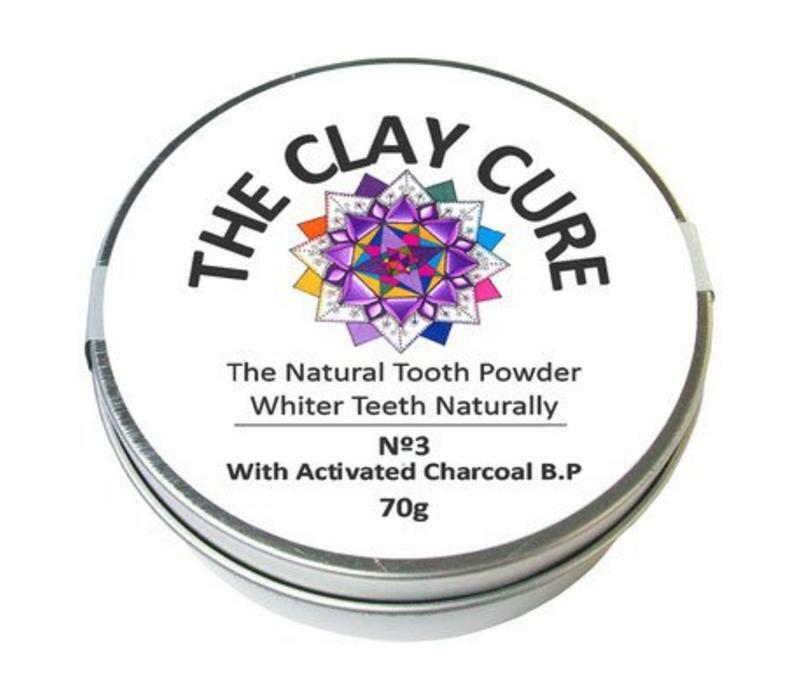 Beige Montmorillonite Clay- Gently polishes teeth, whilst giving them a boost of essential minerals that may help to remineralize your teeth.This very pure clay is known for its properties in absorbing toxins, impurities and heavy metals. Deeply nourishing to teeth and gums, in addition, it is known for strong anti-inflammatory action. Kaolin Clay - We use a pure Eco-certified Kaolin clay. Kaolin is very high in calcium, silica, zinc and manganese, its use helps to polish and whiten teeth. It is mild and soft and particularly good for people with very sensitive teeth and gums. Well known for its properties in drawing toxins from the mouth. Soothe bleeding gums. Calcium Carbonate - Is a basic calcium supplement that contains one of the highest concentration of elemental calcium, making it an optimal supplementation for supporting healthy teeth. Calcium is one of the key building blocks that our teeth are made of. Calcium carbonate provides clinically proven benefits and relief in respect to dentin hypersensitivity. It has also been shown to aid in rebuilding enamel. Sodium Bicarbonate - Sodium bicarbonate has mild abrasive properties that help to remove plaque build up and polishes away stains.Sodium bicarbonate significantly contributes to a more alkaline pH, an acidic oral environment eats away at tooth enamel causing cavities. The pH in our mouth determines to a large extent what population of bacteria are allowed to flourish. Sodium Bicarbonate is also used to naturally whiten your teeth. Xylitol - is a natural sweetener derived from the fibrous parts of plants. It does not break down like ordinary sugar and can keep a neutral pH level in the mouth. Xylitol also prevents bacteria from sticking to the teeth. This how it can protect teeth from decay. Bacteria in the mouth that are causing cavities are unable to digest xylitol, their growth is generally reduced. The dental benefits of xylitol also include saliva. Saliva that has xylitol is more alkaline than saliva stimulated with others sugars. Research has also shown that the use of xylitol helps repair damage to the enamel. Himalayan Salt - In addition to its tooth scrubbing qualities, Himalayan rock salt is high in trace minerals that are beneficial for oral health. It will help to heal mouth sores and irritated gum and is also a natural antimicrobial. INGREDIENTS: Calcium Carbonate (Food Grade), Montmorillonite Clay, Kaolin Clay BP, Sodium Bicarbonate (Alu Free), Xylitol, Activated Charcoal BP, Himalayan Rock Salt.